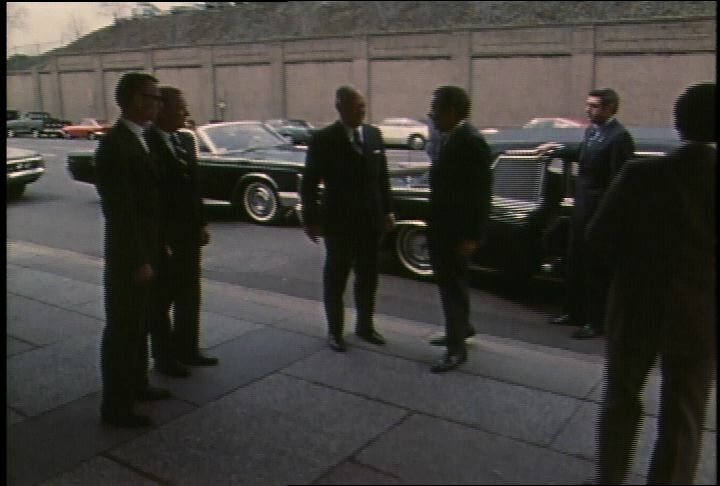 Silent footage of the Department of State and President Richard Nixon getting out of a limousine and sitting down to sign. Soviet and American nuclear forces reach rough nuclear parity in the 1970’s. Each side, pursuing its own interest, negotiates the first successful arms control agreement, SALT I. In May 1972 President Nixon found himself in Moscow delivering a message of peace and friendship. Nixon announced the first major superpower arms control agreements, SALT I and the Anti-Ballsitic Missile (ABM) treaty. Nixon described his feeling about negotiating with the Soviets. “I didn’t trust the Russians. But I recognized that ... there was no alternative but to have some relationship of ‘live and let live’ between the two superpowers.” Two years after the historic meeting in Moscow, Nixon was forced to resign due to Watergate. ABM silos in the United States were shut down but the production of ballistic missiles armed with multiple nuclear warheads (MIRV’s) contributed to a massive increase in weapons in both the United States and the Soviet Union. Chicago: “War and Peace in the Nuclear Age; One Step Forward; Signing Convention of Bio Weapons (Part 1 of 2),” 04/10/1972, WGBH Media Library & Archives, accessed April 22, 2019, http://openvault.wgbh.org/catalog/V_FC2F6500587946C5A787A5975C4BDD9B. MLA: “War and Peace in the Nuclear Age; One Step Forward; Signing Convention of Bio Weapons (Part 1 of 2).” 04/10/1972. WGBH Media Library & Archives. Web. April 22, 2019. <http://openvault.wgbh.org/catalog/V_FC2F6500587946C5A787A5975C4BDD9B>.